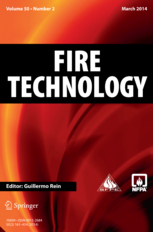 Fire Technology publishes original contributions, both theoretical and empirical, that contribute to the solution of problems in fire safety science and engineering. It is the leading journal in the field, publishing applied research dealing with a full range of actual and potential fire hazards facing humans and the environment. The aim of Fire Technology is to push forward the frontiers of knowledge and technology by encouraging interdisciplinary communication of signification technical developments in fire protection and subjects of scientific interest to the fire protection community at large. SFPE membership includes free access to Fire Technology–visit the Member Resources section for access link. You can also follow Fire Technology on Twitter for even faster updates at twitter.com/FireTechnology.